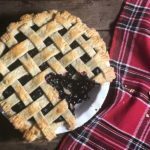 This blueberry raspberry pie recipe is perfect for cold winter days. After all, there’s just something about a berry pie that screams Christmas. Next, cut the cold butter-flavored Crisco into four pieces and place them into the dry mixture. Use a pastry blender to work the Crisco into the other ingredients. Then, cut the cold butter into 1 Tbsp pieces and place in the mixture as well. Again, use the pastry blender to break the butter this time up into chunks until the mixture looks like cornmeal. Once the Crisco and butter are blended into the mixture, take a glass measuring cup and fill it to the ½ cup mark with cold water. Then, drop a couple of ice cubes into the water until it rises to the ¾ cup mark. Next, pour the water a little at a time into the dry mixture and stir with a wooden spoon. Do this until there is no water left, but do not let the ice cubes fall into the mixture. Use your hands to begin compressing the dough in the bowl. Move it onto a lightly-floured surface and continue to knead the dough until it comes together. Work the dough into a ball and then cut it into two pieces, one slightly bigger than the other. Use your hands to compress the two pieces into disks. Wrap both pieces in plastic wrap and place in the fridge for at least three hours. Once at least three hours have passed, remove the discs from the fridge. Lightly flour a clean surface again. Then, unwrap the slightly bigger piece of dough and place it on the counter. Begin rolling it out into a circle until it is big enough to be draped onto your pie dish with dough to spare along the edges. Begin rolling out the second piece of dough to be about the same size circle. Next, use a tape measure to make marks in the dough in 1-inch increments and then cut the dough into several strips. Leave the strips on your counter until you are ready to lattice the pie. To get started, place the berries in a medium-sized pot. Then, cut a lemon in half and squeeze its juices on top of the berries, being careful not to get any seeds in the mixture. You could also just use about 1 Tbsp of lemon juice. Place the pot over medium-high heat until the berries begin to melt. You want to continue to stir the mixture every minute or so to ensure that the berries do not burn. Once the berries have begun to melt, add in the dark brown sugar and granulated sugar and stir, still over medium-high heat, until combined. Next, dissolve the cornstarch in just enough hot warm to get it liquified. Pour the cornstarch into the berry mixture and stir. Next, add the butter and stir until melted. Finally, mix in the cinnamon, nutmeg, cardamom, vanilla extract, and salt. Once all ingredients are combined, remove from heat. Let cool slightly for about 5 minutes, then pour the blueberry raspberry pie filling into the pie dish, on top of the bottom layer of dough. At this point, you can preheat your oven to 375 degrees. Lay five of the dough strips equal distance apart across the top of the pie filling. Fold down the second and fourth pieces and lay another strip of dough in the opposite direction. Then, lay the second and forth pieces over it in their original position. Next, fold down the first, third, and fifth pieces and do the same thing. Make sure that all strips are laid equal distance apart. Repeat this sequence until the whole pie is covered. Once all of the strips have been laid (and keep in mind that you may have some leftover) trim the excess parts of them so that they are all about ½ inch from the edge of the pie dish. Then, tuck the overlay pieces underneath to form a nice thick crust. Press a fork into the dough about an inch around the entire perimeter. The last step is to make an egg wash. Crack an egg into a small bowl and add the milk or half and half. Scramble with a fork, then use a pastry brush to apply the wash to the lattice pieces. Place your pie on the middle rack and bake for about 35 minutes or until the lattice is slightly golden brown. Let cool before you serve and enjoy!